I saw this marinade recipe in the June 2012 issue of Cuisine at Home and decided to make it for dinner. I marinated the beef in half of the marinade for 3-4 hours before grilling it up. 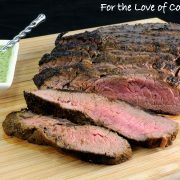 I served the flavorful and tender flank steak with the other half of the marinade as a dipping sauce. My kids could not get enough of this steak and tart dipping sauce. They ate every single bite on their plate which made me very happy. My husband had the leftovers for lunch the following day and said it was delicious. I served this steak with a delicious chopped salad which will post tomorrow. 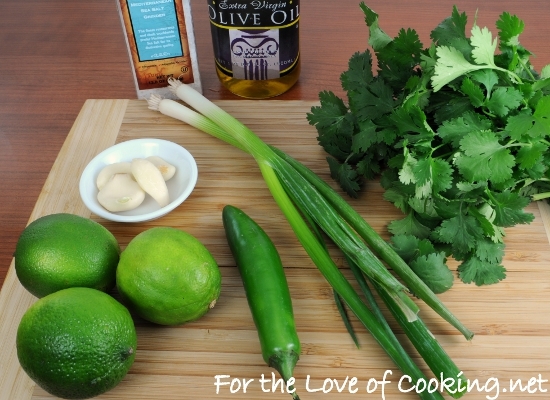 Place the cilantro, lime juice, oil, garlic, green onions, Serrano chile, and sea salt together in a bowl. Blend with an immersion blender until smooth. Place a flank steak into a large zip lock bag and pour half of the marinade into the bag. Squish the bag so the marinade is completely covering the flank steak. Place into the refrigerator and let marinate for 3-4 hours. Reserve the other half of the marinade as a dipping sauce. Remove the steak from the refrigerator 30 minutes prior to grilling. Preheat the grill to medium high heat. Brush grill grate with oil. Grill flank steak, covered, for 2-3 minutes per side for medium-rare. If using a grill pan, heat the pan over medium high heat and coat with cooking spray. Place the flank steak into the pan and cook for 3-4 minutes on the first side, flip and cook for 2-3 minutes on the other side for medium-rare. Transfer to a cutting board and let the meat rest for 5-7 minutes before slicing and serving with reserved sauce. Enjoy. You know I am a cilantro-lime fan. I am definitely going to make this marinade. I bet it would even taste good on grilled chicken, what do you think? BTW, your steak photo looks great, so great that I want to take a bite. Great job photographing the meat as I am still learning. I love the flavors of lime and cilantro together and have used it on many different cuts of meat. I love the looks of your delicious flank steak. Also cilantro and lime fans here. Especially if there’s a bit of spice in there too…a sweetness. 🙂 If you have leftovers, you can use the meat in so many other ways. This looks amazing! 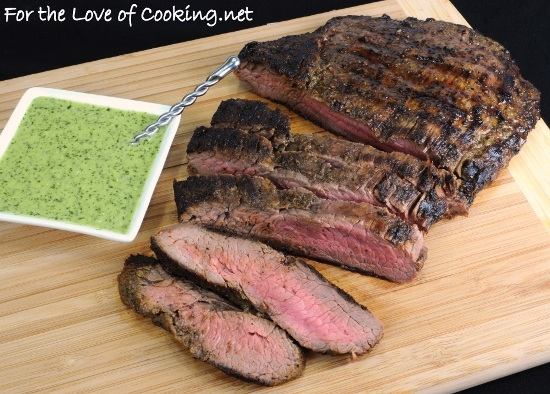 I looooove cilantro and this looks like a nice summer steak. Yum! I saw this recipe in that issue and have been wanting to try it. Thanks for “testing” it for me! If you and your family loved it I know my family will love it, too! I can’t wait for the chopped salad recipe, Pam! Yum…that looks excellent Pam. I make an Asian type flank steak but this one looks even better. Definitely will make it! This looks wonderful! For some reason steak can really intimidate me, but i should try this! Oh that looks/sounds fantastic! I must give it a try! Freaking gorgeous! Love the charred grill marks. This would be absolutely perfect for tacos and/or burritos! Yum! If the steak was half as good as it looks in your photo then it was terrific. I make a similar sauce but there is no green onions in it. I can’t wait to try your recipe. Those are all my favorite flavors! This looks so good, I am dying to cook some steaks! That sauce look oh so yummy! This is a winner! look at all that green! i love that you saved some of the marinade for a sauce–good thinking! 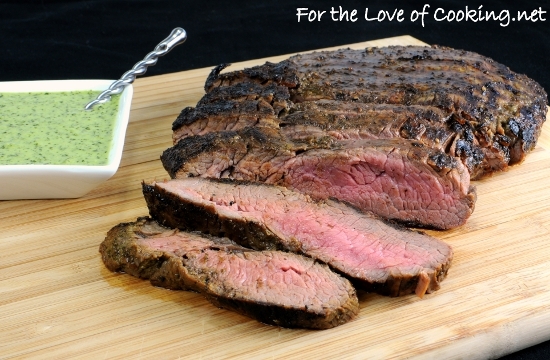 Too funny – I just featured flank steak in fajitas on my blog today! Love this cut of meat! My family will love this recipe, Pam. It looks like we are finally going to get some decent grilling weather. I hope you have a wonderful Mother’s Day and look forward to seeing you at the market soon. Yum, looks delicious. The dipping sauce looks wonderful. Great flavors! I’ll use this recipe this week with flat iron steaks that I have. When cilantro and lime are in the mix, you know you just can’t go wrong! This sounds great! Fabulous! This looks like something I would make up for the grill, I love everything about it. Flank steak is probably my 2nd favorite cut of beef, second only to ribeye. One of my favorite flavor combinations! This was lovely! I threw the marinade together and stuck it in the fridge before the boys & I took my mom to the beach for the day. When my husband got off work, and we were on our way home, he threw it on the BBQ. Soooo good!! (And easy :)) Thank you, Happy Mother’s Day! Super easy, super delicious. My kind of recipe. Will definitely make this one again!! Can someone please leave an actual review? It’s great that you all think the dish sounds yummy, do you really need to tell the world that it’s a good read? I guess Missy and Julie made the dish but seriously people. I’ve made this numerous times. I usually double or triple the recipe and stir some of the sauce into my guacamole, over fresh tomatoes or other veggies and stir it into hummus to mimic the Trader Joe’s cilantro/jalapeño hummus. I just made it today (doubled) and thought I should rain praise on the blogger who shared it. I did this on the skillet, and it turned out fantastic. I mixed the leftover marinade with fat free plain Greek yogurt to make it a bit creamier and cut the potency a bit, and that was a hit. It also requires less of the marinade to be set aside. This will definitely be part of my arsenal moving forward. Thank you! I make this marinade with chicken and it’s fantastic – best I’ve found. I marinade for 30-45 minutes and whatever sticks to the chicken goes into the pan with it. There’s so much wonderful flavor and it’s the perfect combination. What do you mean by “covered”? Closing the lid of the grill. Hi! I just wanted to tell you how awesome this is. I bookmarked it eons ago and still make it all the time. The sauce is so good that I usually triple it, use a bit for the meat and the rest for drizzling. I’ve also stir it into hummus. It’s nearly identical to the Trader Joe’s cilantro-jalapeño hummus but made by ME! I just thought I’d FINALLY thank you!